Since 1982, the Discovery Channel has brought beautiful and exotic wildlife from around the globe into people's homes. In 2016, those efforts expanded into special collectible silver coins. 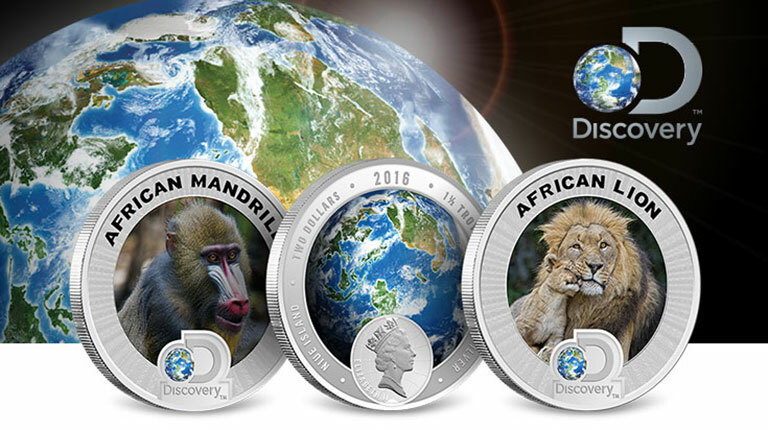 The Discovery Endangered Species Africa Silver Coin Set features photo-realistic images of the African Lion and African Mandrill, each on 1.5 troy ounce legal tender coins. Presented in a custom presentation case in the form of a world traveler's valise, this two-coin proof silver set totals three troy ounces of .999 silver. 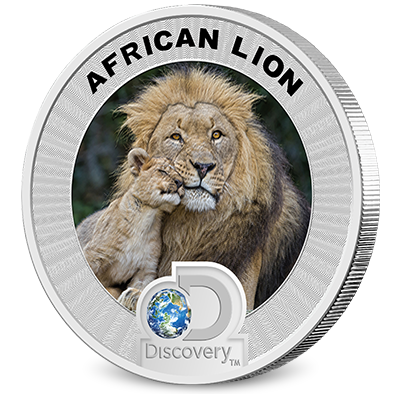 Only 700 Discovery Endangered Species – Africa silver coin sets will be minted. “African lion” refers collectively to the various subspecies of lion that are found on the continent of Africa. The lion is part of the genus Panthera, which also includes other big cats like the tiger, leopard, and jaguar. The lion is widely considered the "King of the Jungle," and once was the world's most widespread large land mammal behind human beings. Over time, however, developing human civilizations nearly eradicated Panthera leo through hunting, disease, and habitat destruction. For instance, the Barbary lion of Northern Africa is extinct in the wild and only known in captivity. Human interference with lions remains a problem, and P. leo is officially a vulnerable species according to the IUCN. There are perhaps 20,000 African lions left in the wild and an additional 1,000 lions found in zoos and nature preserves around the world. The mandrill is an omnivorous primate species found predominantly in tropical rainforests and is confined to a small portion of west-central Africa that includes Cameroon, Congo, Equatorial Guinea, and Gabon. Closely related to baboons but shown to be part of their own genus, the mandrill is best known for its array of bright and bizarre coloring. Thanks to its blue-and-red snout and gold beard, the naturalist Charles Darwin said of the mandrill: "No other member in the whole class of mammals is coloured in so extraordinary a manner as the adult male mandrill." The gravest threats to mandrill populations are loss of habitat through deforestation and, to an even greater extent, hunting by humans for their meat. This is why the IUCN officially categorizes the mandrill as a vulnerable species. Estimates place the current mandrill population in the wild at only 3,000 individuals. Every set in the Discovery Endangered Species silver coin series is safely housed in a handsome presentation case constructed to resemble a traveler's valise. The display case and packaging of the 2016 Discovery Endangered Species Series - Africa truly brings this two-coin set together. The display case features a clasp and is decorated on all of its surfaces by a classic-style world map. The certificate of authenticity (COA) is included, individually numbered, and personally signed by the designer. Beyond their message of preserving our planet's most endangered wildlife, these 1½ ounce silver coins also exhibit remarkable aesthetic quality. The gorgeous, full-color designs were an in-house creation by Gainesville Coins' own Putri W. Ritter. 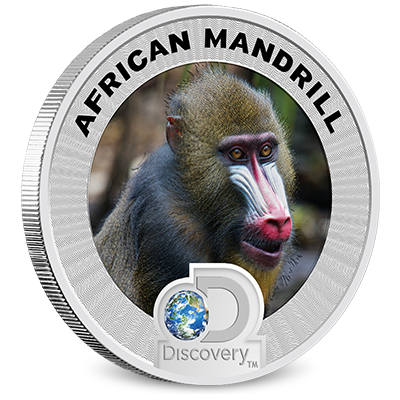 In vibrant colorization, the real-life images of the African lion and African mandrill pop off of the coin's surface. 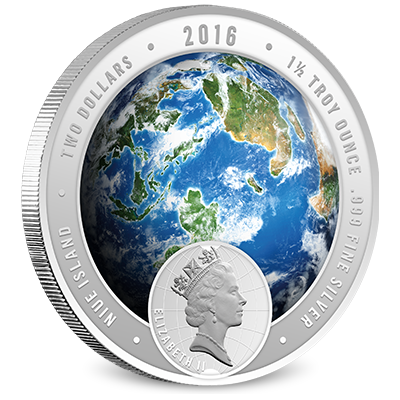 Moreover, these coins are officially licensed by Discovery™ and are legal tender of the Government of Niue Island.